Although Ruger (formally known as Sturm, Ruger & Co.) may have had humble beginnings, the Connecticut-based company has grown exponentially. The once-small company began as a partnership in 1949 and has blossomed into one of the World’s foremost weapons producers. Over the last 60 years, Ruger’s been busy mastering the art of manufacturing durable and reliable firearms. Unlike many of their rival companies, Ruger has established themselves as a premier manufacturer of all types of weapons; they’ve produced several award-winning shotguns, rifles, double-action revolvers, and semi-auto pistols. Once they nailed quality, they decided to take on quantity next. After successfully completing their “Million Gun Challenge to Benefit the NRA” promotion, Ruger decided to up the challenge; their new goal has been to produce over two million firearms a year! In fact, Ruger has been the top-seller of handguns several times over in the past decade. In order to stay ahead of their competitors, Ruger’s been embracing innovation at every opportunity. 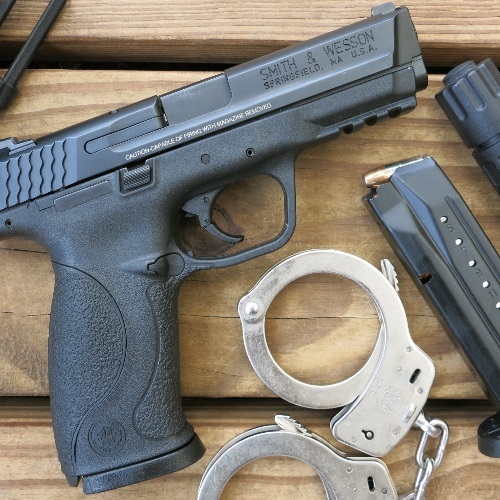 One of their most recent innovations was in late 2015, when they introduced the American Pistol. This isn’t just another polymer-framed semi-auto; it’s an all-around exceptional handgun. Personally, I come from a small town, but nevertheless, I see these all the time down at the range. My buddies and I rely on our Americans for top-quality recreational/competition shooting and for reliable home/personal protection. Below, we’ll discuss what exactly makes these pistols so outstanding. The first thing I noticed about the American Pistol was its rugged build. Ruger’s intentions were clear, they hoped to upgrade nearly every feature of this semi-auto’s build to improve handling, and they delivered. I was skeptical at first, but once I fired it, I was immediately impressed. 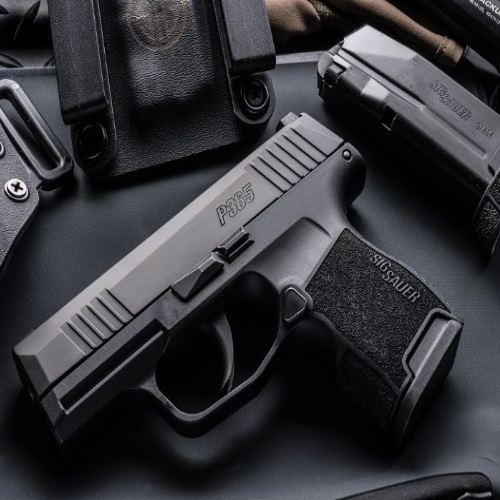 I initially envisioned that the American Pistol would be yet another polymer-frame, striker-fired pistol in a market oversaturated with ordinary lackluster firearms. However, Ruger’s state-of-the-art engineering plus their high-grade materials/components came together to create a firearm that combines remarkable handling, ergonomics, and precision. To effectively upgrade the American Pistol’s control, Ruger threw on a barrel cam, lowered the mass of the slide, and designed non-slip surfaces including useful slide serrations and grip frame texturing. Nevertheless, my favorite improvement has got to be the grip system. Ruger developed three different grip modules which not only give your gun a custom-feel but also improve the trigger reach. Another reason why I love this Ruger is for its sight system; my accuracy has improved drastically once I switched over from my Beretta. The dovetail Novak® three-dot sights are standard on the American Pistol, and are coupled with rear, windage-adjustable sights. 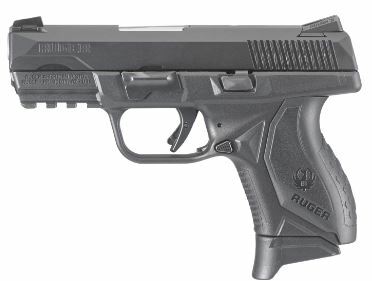 Besides for the adjustable grips, Ruger also incorporated several other key features which make this one of the most comprehensive pistols on the market. In addition to the ambidextrous slide stop and mag release, each American Pistol frame includes a built-in Picatinny rail. Ruger currently manufactures these chambered in 9mm and .45 ACP, with compact variations available for either caliber. I’ve rarely come across a semi-auto handgun with this level of refinement and available options. In terms of the American Pistol’s safety and assembly, Ruger wanted to concentrate their efforts on user-friendliness. They succeeded by including an internal, automatic sear block system, and an integrated safety. Furthermore, the gun’s design doesn’t require a trigger pull to disassemble, which makes its upkeep even safer. The safe and easy takedown doesn’t stop there. In fact, I don’t even use tools to disassemble it. 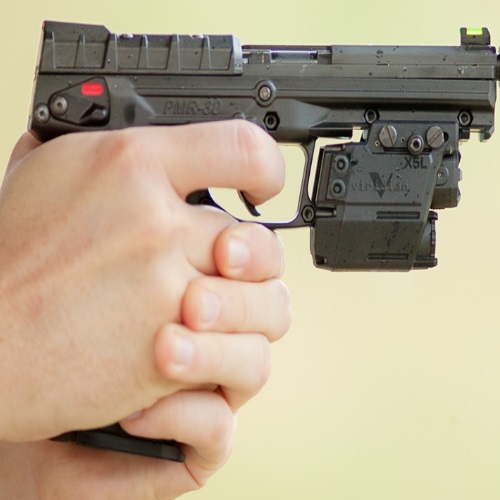 The straightforward process begins by locking the slide back, turning the take-down lever, then releasing the slide, and finally pulling it forward and off the frame of the gun. With a disassembly this easy, there’s no excuse not to keep your American clean and well-oiled. One of Ruger’s main objectives during the American Pistol’s development was to guarantee that it could endure harsh conditions. During their final testing, Ruger successfully fired over 25,000 rounds (of 9x19mm NATO ammo) without the gun requiring any tweaks or repairs. The American can handle almost anything! I’ve fired many types of rounds including hollow points and blanks, and I’ve yet to experience any malfunctioning. Furthermore, I was also very impressed with their trigger and Browning-type locked-breech short recoil action that they put into the American. In my experience, these key adjustments allow for a short take-up and positive reset while effectively reducing recoil. To make shooting even easier, Ruger added a pre-tensioned striker system for positive ignition without compromising the comfortable trigger pull. When you consider all of these features in addition to the extraordinary sight system and first-rate handling, this gun is truly something to behold. The magazines of the Ruger American Pistol might be their most underrated feature. Every American Pistol ships with two nickel-Teflon® plated steel magazines which are extremely reliable and durable. To make it even more user-friendly, Ruger added a few ambidextrous features, including a magazine release. Besides for the two mags, the American Pistols also come with three interchangeable grip modules (don’t worry, switching them out is quick and easy). Although the American Pistol is already more than you could ask for, the fixed MIL-STD-1913 Picatinny rail opens the door to a massive array of accessory options. Shooters can choose between all types of lights, lasers and infra-red to attach to their American; personally, I went with the Streamlight TLR-4 Tac Light & Laser. All things considered, the Ruger American Pistol was a pleasant surprise. My initial concerns were mitigated after firing just one magazine. I realized that Ruger didn’t just redesign their older models or copy their competitors; they completely revamped the polymer-framed semi-auto pistol market. The amount of new and improved features is astonishing; it’s rare to find a handgun with this kind of power, handling, and accuracy balanced so well. To make the deal even sweeter, the MSRP is $579, but I’ve seen them sold for lower at the counter. The American Pistol is not only affordable; it’s also completely American-made. Few gun purchases will leave you as satisfied as this one –I highly recommend you get yours ASAP. There was not a single thing wrong with the shooting, ejecting, and feeding. I know lots of people feel the need to ‘break in’ certain firearms, but this was not the case in my opinion. It is a smooth and reliable operation from the get-go. What more can you ask for? Like I said, this was a significant improvement then when I was carrying my Barretta. But I also know full well that it is not the gun, but rather the gun’s operator, which makes the bigger difference. This gun evidently helped me with my aim, which made it all the more accurate. The thing cycles properly and without incidents, so as far as I am concerned, its action is spot on. Honestly, I am not that particular when it comes to firearm actions. If it works, it works. I try not to knock a gun until I have fired it, so its action would have to be pretty catastrophic for me to form a negative opinion of it. This gun feels great in my hand. I just love the feeling of a full-size pistol, you know? The frame texturing and different grip options make it a very accessible gun, even for those who different types and sizes of hands. The sights on the American really complete the look and feel, and make the American a great purchase, right of the box. While it felt good and fired properly, it was a tad heavy at times. There were times when I would finish a magazine and have to wring my hand a bit. I feel a duty pistol should strive to be as lightweight as possible because it is intended to be carried at all times. Overall, a very positive experience with this handgun. I own a Ruger American, so I know of what I speak. This gun is a machine, I have a habit of mixing my range ammo in my magazines for an obvious reason. I intentionally try to get them to foul, I want to know my carry will function no matter what’s in it. It does that in spades. I have used 115gr FMJ to 147gr JHP with 4 to 5 different manufacturers in the same magazine including Hornadays 124gr JHP Match Steel. If you have ever compared size, the Match Steel are just a smidge shorter than almost every other manufacturer loaded ammo. Doesn’t matter, the American functions from one round to the next flawlessly. The review hit on the fact this is not your typical “plastic” gun, in that it has some heft to it. The heavy metal barrel end, helps keep this nail driver right where you want it. The reason the author shot better with the Ruger wasn’t him, this gun will make everybody look good. My wife and I are both left handed, so we chose the fully ambidextrous model 8639 in the compact version. The author failed to mention on top of all the other reasons to buy the American full size or compact, Ruger is aware there are left handed people that buy and shoot guns, unlike nearly every other manufacturer that considers us an after thought at best. Buy the American, and go stand next to a Glock at the range and have a nice day.